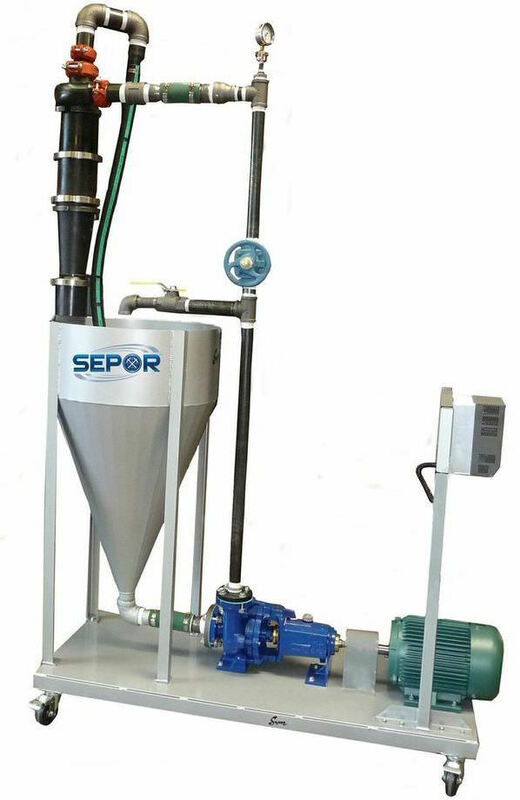 Sepor’s Cyclone Test Rig is designed for laboratory testing of classifying various solids in a slurry. It is equipped with a 2 inch Krebs Urethane Cyclone, a new, larger 283 liter sump (75 gallons), a 1-1/2 x 2 slurry pump with a 7.5 HP/220, 380 or 440 V/3 Ph/50-60 Hz TEFC motor, a frequency inverter for variable speed of the pump, pinch valve to regulate flow, internal piping and valves to circulate the slurry through the cyclone from the sump or to re-circulate the slurry, and a pressure gauge to monitor the pressure drop across the cyclone. All equipment is conveniently mounted on a sturdy structural steel frame with swivel castors for mobility. The Gmax 2 inch cyclone has a typical separation range for particles of 15 microns in size. Typical applications for these cyclones are to dewater sol- ids in slurries, concentrate solids – especially when no solids exist in the slurry smaller than 15 microns, or to classify solids in slurries in the particle size range of 15 to 35 microns, with the large particle size going to the high % solids underflow and the fine particle sizes and most liquid going to the overflow. See cyclone performance table on following page. 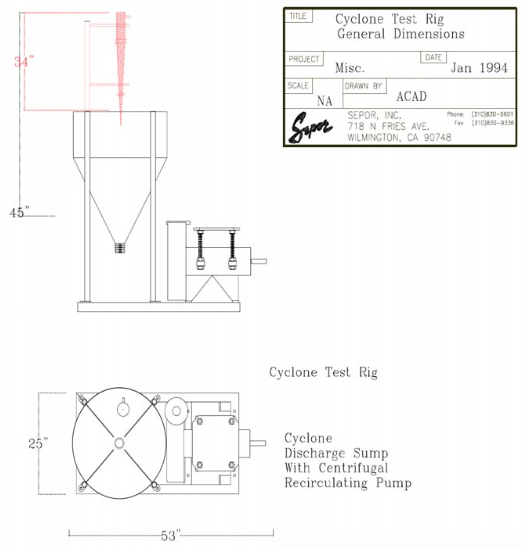 The cyclone test rig uses Krebs. The Kreb cyclone’s results may be scaled up for process use, as they are manufactured for mineral and other industry applications. The cyclone test rig will operate cyclones ranging from 1/2 inch up to 4 inches. The volume of slurry required to produce desired separation ranges from 1.5 GPM @ 100 Feet of Head (1/2″) to 80 GPM @ 80 Feet of Head (4″). The pump and sump capacity would be too small for cyclones larger than 4″. Roughly, the particle separation size range for these sizes of cyclones is 0.5 through 82 microns. Custom cyclone test units may be designed for larger cyclones. Standard Classifying Cyclones are manufactured with sectionalized metal housings fitted with replaceable molded liners of abrasion resistant elastomers, ceramics or alloys. A combination of high density gum rubber and ceramic liners is commonly used for metallurgical applications. These cyclones feature involuted feed entry into the cyclone, which minimizes turbulence due to feed entering the cyclone. This allows these cyclones to make a finer particle size separation than would be possible with a tangential feed entry cyclone. Pictured are the classifying cyclones we use on pilot plant applications and the cyclone test rig. FEATURES: Interchangeable orifices can be used to obtain a range of separations with the cyclone. The feed entry nozzle for each cyclone is molded into the inlet head liner and for each cyclone, at least two different size feed nozzles are available. Three sizes of vortex finders are available for each cyclone. Apex valve liners or inserts can be used to change the size of the apex orifice. Some models may be manufactured without the cylinder section, or with a longer than normal cylinder section. Generally, the longer the cylinder section, the finer the particle size separation obtainable. Metal cyclone housings fitted with molded liners offer the advantage of replacing the relatively inexpensive liners instead of the more expensive cyclone. Feed inlet and overflow adapters can be supplied for connection by means of Victaulic couplings, grooved or plain end, or with standard flanges. A typical standard cyclone configuration is cast steel construction with gum rubber lining. We have urethane linings, stainless steel construction or all urethane construction available for our classifying cyclones. For capacities and classifying particle size ranges, refer to the following table. A cyclone’s performance is determined by the particle size distribution, the particle densities, the percent solids of the feed and the volumetric feed rate of the cyclone. Feed to the cyclone should have a density of 156 to 200 pounds per cubic foot (dry solids). These solids should be in a slurry form ( a mixture of liquid and solids). The feed solids concentration should be no more than 30% solids by weight. The feed should not be unusually viscous, such as might exist with a high concentration of clays. Above performance characteristics are based on average operation conditions.